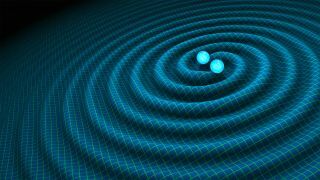 An artist's illustration of two black holes spiraling together, creating gravitational waves in spacetime. A new software program that uses artificial intelligence can help rapidly detect and analyze gravitational waves — ripples in the cosmic fabric of space-time — from catastrophic events such as collisions between black holes, a new study finds. The new technique, called deep filtering, can help researchers see cataclysmic events that current software might not detect, such as titanic mergers in the hearts of galaxies, according to the authors of a new paper describing the work. Gravitational waves are ripples in the fabric of space and time. They are generated when any object with mass moves, and they travel at the speed of light, stretching and squeezing space-time along the way. The Blue Waters supercomputer numerical relativity simulation of two colliding black holes with the open source, numerical relativity software, the Einstein Toolkit. Researchers developed a method based on artificial intelligence neural networks to better analyze gravitational wave data. Gravitational waves are extraordinarily difficult to detect, and the ones that scientists can detect are from exceptionally massive objects. Although the existence of gravitational waves was first predicted by Albert Einstein in 1916, it took over a century for scientists to successfully detect the first direct evidence of gravitational waves, using the Laser Interferometer Gravitational-Wave Observatory (LIGO) to spot the gravitational aftermath of two black holes smashing together. The discovery of gravitational waves earned three scientists the 2017 Nobel Prize in physics in October 2017. Since then, researchers have also detected gravitational waves from a colliding pair of dead stars called neutron stars — findings that might have helped solve the decades-old mystery of how some of the universe's heavy elements were created. However, the software that currently analyzes the signals that gravitational-wave observatories detect can take several days to narrow down what kind of event might have generated those gravitational waves, study co-author Eliu Huerta told Space.com in an interview. Moreover, this software is specialized to detect mergers between objects that are in roughly circular orbits with one another and relatively isolated from their surroundings, according to Huerta, a theoretical astrophysicist at the University of Illinois at Urbana-Champaign's National Center for Supercomputing Applications. The software will likely fail to detect gravitational waves from objects in areas where stars are densely packed together, such as the nuclei of galaxies, where the gravitational pulls of nearby stars can distort orbits from circular to more "eccentric" or oval in shape, Huerta said. Now, the study authors suggest that artificial-intelligence software could help greatly speed up the analysis of gravitational waves, as well as "[enable] the detection of new classes of gravitational-wave sources that may go unnoticed with existing detection algorithms," Huerta told Space.com. One of two facilities that belong to the Laser Interferometer Gravitational-wave Observatory (LIGO), which made the first-ever direct detection of gravitational waves. The new AI software involves artificial neural networks, in which artificial components dubbed "neurons" are fed data and cooperate to solve a problem, such as recognizing an image. A neural network then repeatedly adjusts the connections between its neurons and sees if these new connection patterns are better at solving the problem. Over time, this process of trial and error reveals which patterns are best at computing solutions, mimicking the process of learning in the human brain. Whereas conventional techniques might take several days to narrow down the features of gravitational events from detector data, cutting-edge neural networks known as "deep convolutional neural networks" could do so within a second, the scientists found. Moreover, whereas conventional methods would need thousands of CPUs (the central processing units of computers) to perform this task, the new technique worked "even with a single CPU — that is, with your smartphone or a standard laptop," Huerta said. In addition, the researchers found that this new technique could also quickly analyze mergers that are more complex than current software can analyze, such as mergers involving black holes in eccentric orbits. The new software also had lower error rates and was better at spotting glitches in the data. Huerta and Daniel George, a computational astrophysicist at the University of Illinois at Urbana-Champaign's National Center for Supercomputing Applications, detailed their findings online Dec. 27 in the journal Physics Letters B. Follow Charles Q. Choi on Twitter @cqchoi. Follow us @Spacedotcom, Facebook and Google+.